Anywhere you see hawks you are likely to see them being chased by smaller birds and not just chasing after them. The following photos (some of which are links to wilcephotos.com) tell two stories. The first story consists of a single photograph of what we might expect to be most common—a bigger, more carnivorous bird chasing a smaller, and less frightening or awe-inspiring, bird. Here the predator seems to be a goshawk, and the prey a dove. 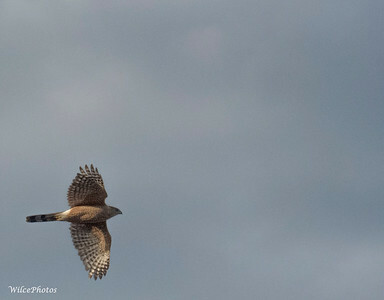 In the next photo we see an accipiter—a mid-sized hawk, in this case probably a Cooper’s Hawk—being chased by smaller birds (unfortunately off camera). 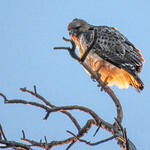 Several times this month (February 2016) I have taken photos of a Red-Tailed hawk perched on one particular snag about a mile from our home. When I say “a Red-Tailed hawk” I mean perhaps the same individual hawk. One morning the big bird was perched on the snag looking calm and in control. when its peace was disturbed by a raven. In the sequence of photos below, we first see the Red-Tailed hawk taking off. Then the chaser—a raven—enters the picture. And finally, the raven collides with the hawk, mid-air. As far as I know, the Red-Tail did not return that morning. Perhaps as it flew away it was doing what, in a human mind, we would call contemplating the weakness of the proposition that might makes right.